Do you have a cavity that needs to be treated? Do not worry. You do not need a dark metal filling creating an eyesore when you smile. Now, we can treat your tooth decay with an option that blends in seamlessly with your enamel. With tooth-colored fillings in Ponte Vedra Beach, you can enjoy a metal-free option that looks natural. Tooth-colored fillings have become the preferred choice to treat cavities because they are more aesthetically pleasing while also being mercury-free. Unlike traditional fillings, no metals are used to make them. Instead, they are comprosed of a plastic and glass mixture, so they are biocompatible and safer than amalgam fillings. The plastic allows us to customize the color of the filling to match your enamel color. No one will tell that it is there as it restores the health and structure of your tooth. Benefits of Tooth-Colored Fillings vs. Amalgam Fillings? Traditional amalgam fillings have held a commonplace in dentistry because they are affordable and durable; however, their use has recently come under scrutiny. They are made from a mixture of metals, including mercury. This raises the concern regarding mercury exposure over time. In addition, they are dark in appearance, making them highly visible. Over the years, they can also cause your tooth to become discolored. For those who have metal allergies, they can lead to pain and irritation. 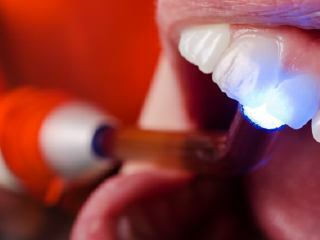 As a safer alternative, tooth-colored fillings are now the popular solution. They are completely metal-free, so you do not need to worry about mercury. 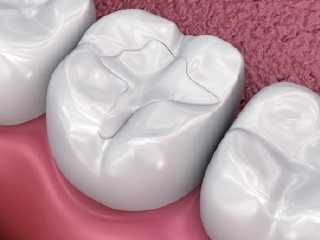 Composite fillings also improve the structure of your tooth. Unlike metal fillings, wedges do not need to be cut into your tooth to place it. As a result, it preserves more of your healthy tooth to promote its integrity. Tooth-colored fillings are quicker and easier to place than their predecessors. They are chemically bonded to your tooth, which means you may not even need a numbing agent if the decay has not progressed beyond your enamel. After the decay is removed, your tooth is cleaned and primed using a weak acid. This opens the pores in your enamel and dentin to ensure the bonding agent adheres to your tooth. 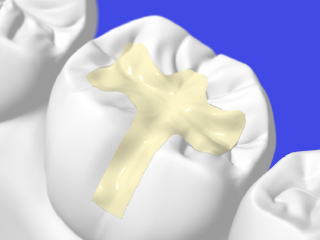 The filling material is customized to match your enamel prior to applying it to your tooth. A special light quickly hardens it. We reshape it to ensure the correct bite and appearance to leave you with a healthy, beautiful smile. With the right aftercare, your new filling can last for several years before needing to be replaced. In addition to brushing and flossing, it is best to avoid putting excessive pressure on the filling. Although it is durable, it can crack or chip. Do not feel insecure about a dark metal filling. We can treat your tooth decay with a solution that looks natural. Contact Ponte Vedra Complete Dentistry today to schedule your consultation.